The transmission system operator (TSO) signed an offshore grid connection agreement with developer Blauwwind — a consortium of Shell, Van Oord, Eneco and Mitsubishi-subsidiary Diamond Gathering Europe — for the third and fourth phases of the Borssele cluster. Under the agreement, Tennet will use its 700MW Borssele Beta transmission network to transmit the power back to the Netherlands' onshore grid. A second 700MW Tennet platform, Borssele Alpha, will be used at the 752MW first and second phases of Borssele, being developed by Dong Energy. 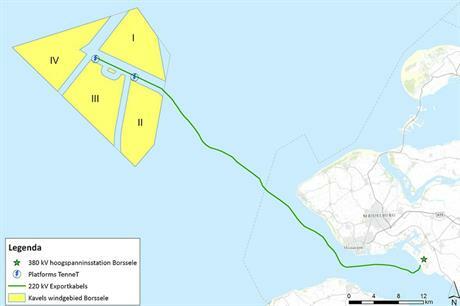 Marco Kuijpers, senior manager for Tennet’s offshore division in the Netherlands, said the agreements "formalised" the connection of Borssele III and IV to the Dutch grid. He added: "As the contract for delivery of the Borssele Beta platform recently has been signed too, this timing is ideal for the efficient execution and fruitful cooperation of our Borssele projects." The turbines to be used at Borssele III and IV have not been confirmed yet, but MHI Vestas signed a conditional supply agreement to supply the site in March. The Dutch government plans to launch a tender for a fifth Borssele site in January, according to the Netherlands Enterprise Agency (NEA).